Both a visual and auditory feast! Jennis uses a host of instruments to create a unique blend that is both modern and timeless … a refreshing and inimitable style that is uniquely their own. We were very pleased to have booked Jennis to play the 33rd Midsummer Festival here in Smithers. From the get-go their professionalism was very apparent, and their performance and music fit perfectly in our diverse lineup. We had them play an intimate venue which festival goers raved about as being one of their favourite performances, and they also had a wonderful main stage set that had the audience transfixed and moving. Both Dennis and Jen stayed at the festival, and joined in the festivities allowing the audience and other artists to interact with them. As a unique duo with a modern roots and blues sound, I would highly recommend them for consideration. JENNIS is one of those acts you dream about when producing shows. Very rarely do bands so new sound so polished together, and the fact that they can seamlessly jump between blues, funk, folk, and rock music during their set is a testament to their skills as musicians and singers. Running a venue for 2 and a half years, as well as producing many other events, I’ve encountered some phenomenal acts from across the country – but it’s a rare occasion when I’m both blown away by what I’m seeing on stage and also truly emotionally engaged in the music. The duo travelled the musical world (and an impressive number of instruments) through their 45-minute set, performing for a small, intimate crowd with the energy and enthusiasm of a large theatre show. Anytime JENNIS come out west in the future, I’ll try to get them on a show I’m putting on – and if I can’t, I’ll be in the front row of wherever they’re playing! I’ve seen lots of bands over the past 40 years, everyone from the Rolling Stones and Pink Floyd to Merle, Haggard and Lisa Minnelli — and I have to say that watching Jennis perform was truly one of the best musical experiences I have ever had. 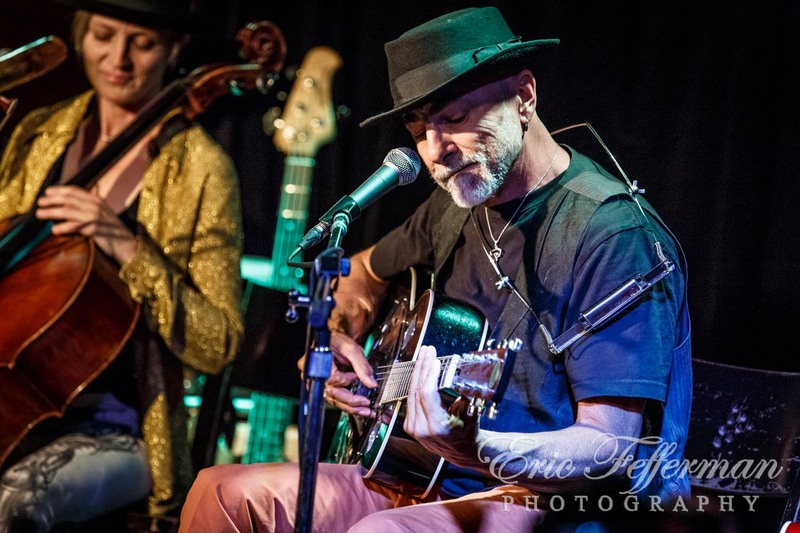 What do you get when you combine some talented songwriting, warm, rich vocals along with a resophonic guitar, cello, flute, jaw harp and even a didgeridoo? A unique and impressive blend of folk, roots and bluesy sounds served up as a fine, entertaining evening of Jennis music. For more kind words, see our House Concert page.